As noted earlier in our review of iPhone 6, many new higher end Android phones sport faster clocked chips, much more RAM and at least twice the number of processor cores as Apple's iPhone 6 and 6 Plus, but still can't match Apple in CPU performance. And because Apple's latest A8 Application Processor is only about 20 percent faster in CPU benchmarks than the company's initial 64-bit A7 from last year, even iPhone 5s remains competitive with this year's most expensive Android phones. In GPU performance, the gap is even larger. Android phones that cost just as much as Apple's new iPhone 6 and 6 Plus deliver real world gaming performance that is simply disappointing. Once again, it's not necessarily a matter of inadequate hardware on these high end Android devices. Versions of Samsung's Galaxy S5 and Note 3 that use Qualcomm's competitive quad-core Snapdragon 801 Application Processor with Adreno 330 graphics turn in respectable low level graphics benchmarks that are as good or better than Apple's. However, in higher level tests of OpenGL APIs--which simulate how video game graphics will actually render--Samsung's scores collapse (below). 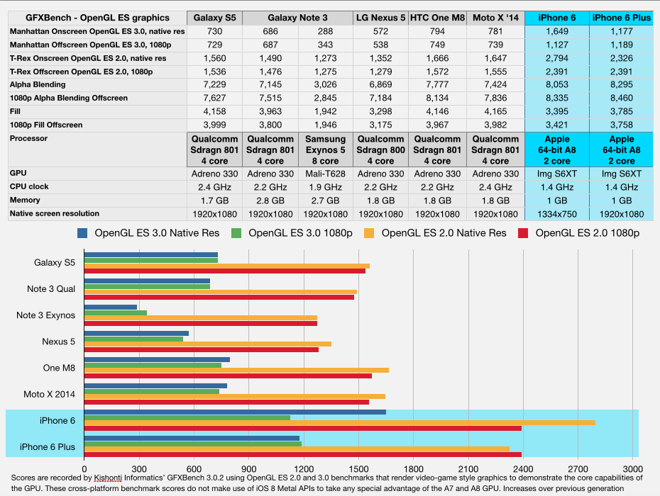 The same issue hits Google's Nexus 5 (essentially a rebranded LG G2), which uses a slightly older Snapdragon 800 with the same Adreno 330 GPU: good results in core graphics power, but very weak numbers in OpenGL tests. HTC's One M8 and this year's refreshed Moto X turn in the same lopsided results, which all point to Android making terrible use of the underlying hardware to actually accomplish real tasks--like a loud revving, gas guzzling motorcycle with fancy chrome tailpipes and ornate flames painted on the side, but barely capable of carrying one person up a moderate hill. Samsung's domestic versions of the Galaxy S5 and Note 3, built using the company's own Exynos 5 Octa core Application Processor, perform even worse in GPU tests because the South Korean conglomerate licenses basic Mali GPU tech from ARM for most of its Exynos chips. Having lots of CPU cores doesn't make up for using Mali graphics. Outside of the expensive flagships that make up a minority of the Android installed base, the majority Android devices also use basic Mali graphics to reach very low price points. The variety in components used across the broad range of Android devices make it difficult for developers to get their apps to perform consistently, a particularly thorny problem when creating games. The combination of hardware fragmentation, poor optimization of hardware by Google's Android software, and a general skew towards cheaper devices at much lower Average Selling Prices results in a market for Android games that focuses on basic, simple titles. Of the top ten highest grossing iPhone games in iTunes, (currently "Clash of Clans," "Game of War - Fire Age," "Candy Crush Saga," "Big Fish Casino," "Farm Heroes Saga," "Hay Day," "Puzzle & Dragons," "Brave Frontier," "Kim Kardashian: Hollywood," and "Bubble Witch 2 Saga") all of them are also available in Google Play, but these titles are often quite simple and all are oriented around selling In App Purchases. Among iTunes' current top ten paid iPhone games ("Five Nights at Freddy's," "Minecraft," "Heads Up!" "Buddyman: Kick 2," "Goat Simulator," "Geometry Dash," "Plague Inc," "Bloons TD 5," "Pumped BMX 2," and "EA Monopoly"), only two are missing entirely from Google Play. However, just because a game is listed doesn't mean that it's playable, or that it works on recent Android devices. For example, the popular fantasy horror game "Five Nights at Freddy's" expressly doesn't work on the Nvidia Shield, an Android device dedicated to gaming. On iOS, it's more clear which devices are supported ("optimized for iPhone 5," and it works on 2012 iPod touch or newer), and no recent models with high end features are excluded. On Google Play, the developer states in the game's description, "Please do not email me with reports of the game crashing. This game will only work on newer phones as stated above [excluding the new Shield]. Crashing issues are the result of not enough memory." There are lots of user reviews on Google Play along the lines of this leading review for "Goat Simulator," which complained, "Samsung Galaxy 3: its all dark you can move around and stuff and here music but urg wont let me see plz fix then I would rate a million stars if I could plz plz fix for samsung galxy 3 plz I would like to see what I am doing." 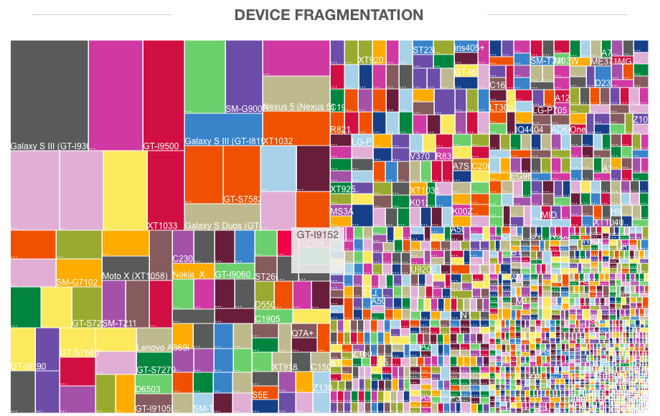 According to recent product fragmentation data compiled by OpenSignal in August, Samsung's Galaxy S3 is the most popular Android device out there among the 18,796 different models the company documented. A Galaxy S3 is of the same era as iPhone 5, but despite being the most popular group of models (there are multiple different variants of the Galaxy S3), even it can't reliably play the most popular Android games. The top comment on popular retro arcade game "Geometry Dash" says, "It lags on my Lenovo s650 but when it comes to Samsung galaxy tab 2 10.1 it does not lag even if it is dual core and my phone is quad core." Similarly, the top review for tower defense game "Bloons" states, "Viewport cuts off for tablet When playing on my galaxy s4 I can see a full level. However when I play on galaxy tab 10.1 2014 edition there is significantly less play area the viewport is smaller. The farms are larger too. I paid for this app and I'm getting ads? Are you kidding me?" These are the top paid games on Android. And the top comments are complaints from people using some of the most popular, mainstream devices made by Android's largest licensee, Samsung. Among the top ten games Google Play highlights as an "editor's choice," or as "best new games," all exist for iOS, too. Most of these games that are new to Android are not new at all in the iTunes App Store. Conversely, among ten of the top "best new games" Apple profiles, only six are available for Android in any form. Among these, top reviews make complaints like, "Nexus 5 downloaded data in less than a minute but the game never loads telling Request timed out!! Game never started!!! So disappointing" for racing game Asphalt Overdrive. Or this one for "Anomaly Defenders," a strategy game: "Great game which is fun to play but it has a problem on my Nexus 5. It refuses to save progress between having sessions. I got to level 10 yesterday but this morning I am back to level 4. It is so annoying to make progress only for it to be gone the next time you play." 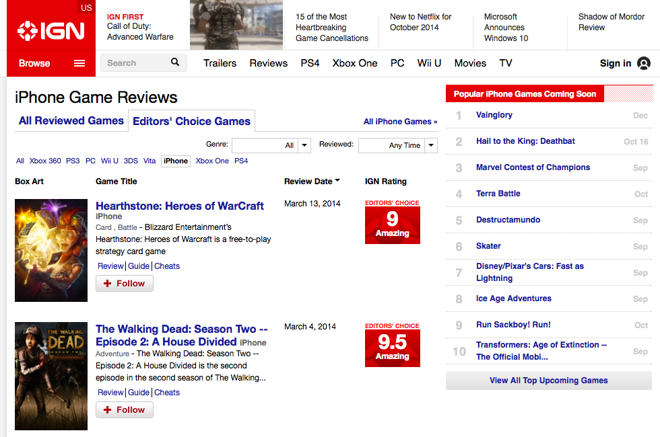 Note that there was no digging around for bad Google Play comments; each one cited in this article appeared on the games' top page among the top two to four user reviews highlighted by the store as "helpful." Five of the top ten App Store editor's picks are games that already make special use of Apple's new Metal API to deliver far better performance on 64-bit iPhones (5s, 6 and 6 Plus), an optimization that was first announced this summer. Two of these popular titles enhanced for Metal haven't made it to Android yet at all: "Plunder Pirates" and "Mr. Crab." And for Gameloft's "Modern Combat 5: Blackout," a player writes, "it's no where near what they are on the picture screen shots, maybe it's cos I'm running on samsung galaxy tab 3 8 and you need something like nexus or something with a higher prosesser and graphics card but very dissapointed." And for tower defense game "Defenders," which appears to get lots of enthusiastic reviews from Android blogs, a player complains, "Performance issue. The graphics are awesome but I am having serious lags here .. don't know why .. I got 1G of ram and a 1.2Dual core cortex A9 processor with PowerVrSGX540 I am pretty sure thats enough to run this game smoothly." Developers are porting top iOS apps to Metal before porting to Android because most of the iPhones sold over the last year were 64-bit iPhone 5s models that can take advantage of Metal. Many of those buyers want buy Metal-enhanced games to take advantage of the premium phone they have. On Android, most of the phones sold over the last year were low end devices with Mali graphics in one of those 18,796 different variations, and most of those users don't want to pay for apps, just like they didn't want to spend any money on their phone. Premium Android buyers who paid iPhone-like prices to get a Galaxy S5 fit into one of those tiny boxes above, right next to the budget buyers who got a Moto X or Nexus 5. They simply don't matter to developers. If they'll put up with getting cut off from Google's Android OS updates after 18 months, they'll put up with waiting six months to a year to get basic ports of some iOS apps and games. Even then, Android's OpenGL implementation will sluggishly run the games on their virtually unused phones as their devices hemorrhage any vestige of resale value. The situation apparent to visitors of the App Store and Google Play is not a matter of Apple simply being a better marketer than Google. Gaming site IGN, which has profiled video games online for a series of platforms since 1996, lists reviews of two dozen iPhone titles over the past year, including a selection of "editors choices" with a rating of "amazing." The site also has a top ten list of upcoming iPhone games due for release during the holiday season, including "Vainglory," a title Apple featured during its September iPhone 6 event. Of the top ten all time "editor's choice" titles IGN lists for iPhone, nine are "amazing," including "Hearthstone: Heroes of Warcraft", "The Walking Dead: Season Two," "Broken Age: Act 1," "Device 6," "Marvel Puzzle Quest: Dark Reign," "Infinity Blade III," "Limbo," "Real Racing 3," "Bit.Trip Presents: Runner 2 Future Legend of Rhythm Alien," and one, "Might and Magic: Clash of Heroes," is "great." Only four of those titles (less than half) even exist on Google Play, including the "great" "Might and Magic: Clash of Heroes," as well as "The Walking Dead: Season Two," "Marvel Puzzle Quest" and "Real Racing 3." Back in April, after Blizzard launched its "Hearthstone: Heroes of Warcraft" title for iOS, the game's production director Jason Chayes explained to Gamespot why it was so difficult to port games to Android. "Just the breadth of different screen resolutions," he said, "different device capabilities--all of that is stuff we have to factor in to make sure the interface still feels good." 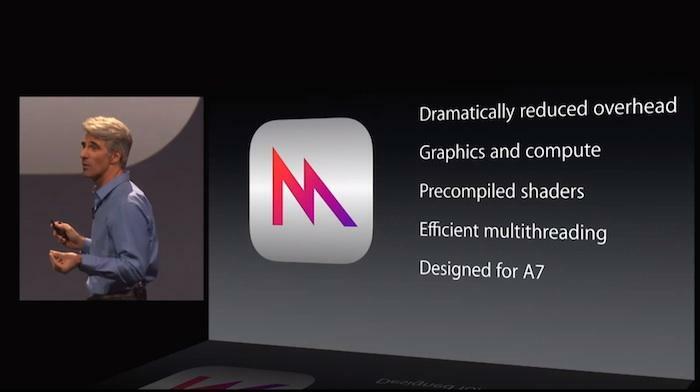 Over the next year, developers will have the opportunity to target iOS users who will soon be mostly running 64-bit A7 or A8 devices capable of dramatically benefitting from Metal-optimized apps (as well as Apple's new Swift language) to deliver the most performance for the demographic of mobile users most likely to buy their software. Or they can target those 18,796 different models.